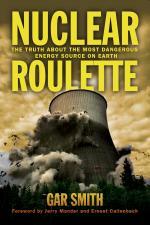 Gar Smith’s Nuclear Roulette: The Truth about the Most Dangerous Energy Source on Earth is a 14-point condemnation of President Eisenhower’s “peaceful atom,” an exposé of official and corporate lies, and a multi-pronged platform of alternatives. When Ike okayed nuclear power, “they screwed the pooch,” says political cartoonist Mike DiBari. Ike’s military-industrial complex wrote our death sentence when the US authorized the development of nuclear energy: humanity will not survive this technology, nor will most other species. One isotope of plutonium has a half-life of 24,000 years. That’s twice as long as the latest interglacial in which Homo sapiens developed agriculture, and thus modern civilization. Another – P-239 – has a 250,000-year half-life. That’s longer than Homo sapiens has been around. But then we have uranium-238 with a 4.5 billion-year half-life, the lifespan of Planet Earth. Tritium has a half life of 12 years; strontium 29 years, cesium – 30 years, and on for the hundreds of hot particles (radioactive isotopes) created by fission. They can split atoms but can’t put Humpty back together again. Nuke heads would have us believe that low-level radiation is harmless. Smith cites several media headlines and official reports asserting just that, despite thousands of studies refuting it. 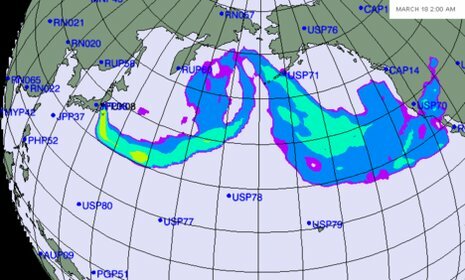 “The impact of Chernobyl and Fukushima-Daiichi is ongoing and radiation still in the environment is inhaled or swallowed, leading to accumulation in the body. One mushroom eaten in affected areas may deliver as much radiation as hundreds of chest x-rays,” he concluded. Radioactive waste and fallout generated by the creation and use of nuclear energy is killing and altering humans and other life forms, and this radiation will be here long after primates sigh their last breath. In the Forward to Nuclear Roulette, Jerry Mander and Ernest Callenbach call the propaganda that nuclear waste can be safely sequestered for 250,000 years “an assertion bordering on the insane.” Nuclear energy’s poison is eternal, and humans have only been around for 150-200,000 years – we’re not likely to be around another 250K to watch over our radioactive waste. To promote such energy is “madness” – as mad as the government of an island subject to volcanoes and tsunamis deciding to build dozens of nuclear power plants. In fact, thousands of studies over the past 60 years show harm from radiation. Not only do cancer rates increase, but the entire organism is compromised as seen by the high rates of congenital birth defects, compromised immune systems, rapid aging and organ failure among those populations near nuclear blasts and plants. The region where most of these birth defects appear, Polissia in Rivne Province, Ukraine, hosts a unique ethnic group which has continuously occupied the land for thousands of years. They rely completely on wild and locally-produced foods, “all of which are radioactive,” reports Wertelecki. These Ukrainians have been ingesting radioactive food, air and water for the past 26 years, and their children show it in the marked increase of birth defects and general failure to thrive. 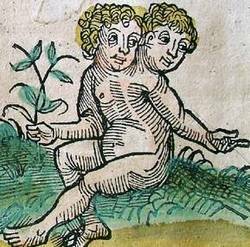 Wertelecki showed not only mutagenic effects passed on generationally, but also teratogenic effects even three generations later. In other words, Chernobyl fallout is still causing birth defects in an otherwise normal, healthy fetus. We can expect the same health consequences in Japan and in the US where most of the Fukushima radiation has settled. Chernobyl’s single reactor meltdown 26 years ago continues contaminating the northern hemisphere today with radiation, and the situation continues to worsen. Which brings us to the Darwin Awards, where humans applaud those who remove themselves from our gene pool, saving the rest of us from their stupidity. Only this time, those “brilliant” scientists who split the atom are taking out humanity, and most other life forms on Planet Earth. The development of nuclear technology is a true Darwinian failure – our weakest link, our suicidally destructive genes. And they, or their progeny, or that portion of humanity promoting nuclear power, still contribute to our gene pool, to our collective demise, to the planet’s 6th Great Extinction. It’s one thing to climb inside a barrel to see if you can survive the drop at Niagara Falls, because you’re only risking your own life and, if you do die, you help humanity by removing your suicide genes from the genome. What Oppenheimer and the US government did was risk not only all of humanity, but the entire planet. The moral depravity of such an act is on par with the decision to develop an energy source certain to wipe out the biosphere just from its waste alone. That governments around the world have fostered this suicidal, ecocidal technology exemplifies pathocracy. We are truly ruled by true psychopathy. The development and use of nuclear power gets the all-time Darwin Award for Homo sapiens. Smith’s section on alternatives is a frightening digression from his prior discussion on governmental lies, cover-ups and captivity by nuclear profits. Here, we find the Smart Grid being promoted, right along with biofuels – both of which have incurred the wrath of privacy advocates and environmentalists. Just as with the nuclear industry, the grid would be contracted out to private corporations with the skills and infrastructure to run it. The US Government would regulate the grid, and all the issues raised in his chapter, The Regulatory-Industrial Complex, would plague a nationalized Smart Grid. He objects to: “a balkanized grid – bankrolled by private industry and guarded by proprietary smart meters.” But, the grid should be regionalized – and Smith promotes localization and decentralization, except not this time. Among the benefits of energy independence, a regionalized electric grid is far less vulnerable to massive, cascading disruptions than a nationalized one. Renewable energy can contribute substantially to energy demands, as Germany, Denmark and other nations have shown, but it cannot replace dig-it-up-and-burn-it fuel under current consumption rates in modern industrial society. Instead, and this Smith does promote, we need to power down – use less and use it more efficiently. Smith, p. 132, citing Joseph Mangano and Janette D. Sherman, “An Unexpected Mortality Increase in the United States Follows Arrival of the Radioactive Plume from Fukushima: Is There a Correlation?” International Journal of Health Services, v. 42, no. 1, Dec. 2011: 47-64. Smith, p. 59, citing Jay M. Gould, The Enemy Within: The High Cost of Living Near Nuclear Reactors, New York: Four Walls Press, 1996, p. 187. Lucy Walker, Countdown to Zero, Magnolia Pictures: 2010. Note 2: · ^ In Bethe’s account, the possibility of this ultimate catastrophe came up again in 1975 when it appeared in a magazine article by H.C. Dudley, who got the idea from a report by Pearl Buck of an interview she had with Arthur Compton in 1959. The worry was not entirely extinguished in some people’s minds until the Trinity test. The US-led empire is now fully captive to corporate profits, to the exclusion of all other values – the very definition of psychopathy as discussed in the breakthrough documentary, The Corporation, and in Andrzej Łobaczewski’s Political Ponerology , which shows how hierarchies like corporations and governments draw psychopaths, so that today they dominate positions of power throughout the world. Rady Ananda, “GM Biofuels: Another Planned Disaster,” 3 May 2010. Monsanto and the US Government still enforce, through use of arms and a Monsanto-led judicial system, intellectual property rights for biotech, and still refuse to label GMOs. Nor do either want to be held responsible for genetic contamination of natural crops, with the incumbent economic losses in global trade, nor for any of the increasing links to eco-destruction and animal and human health problems. We the People still insist we have the right to know what’s in our food and drug supply. This applies not only to the biotech world, but the increasingly linked nanotech world, as well. California’s historic Proposition 37 has the overwhelming support of the citizenry and should finally assert the people’s will, these 16+ years later. That is, unless those easily hacked voting systems serve the corporatocracy.